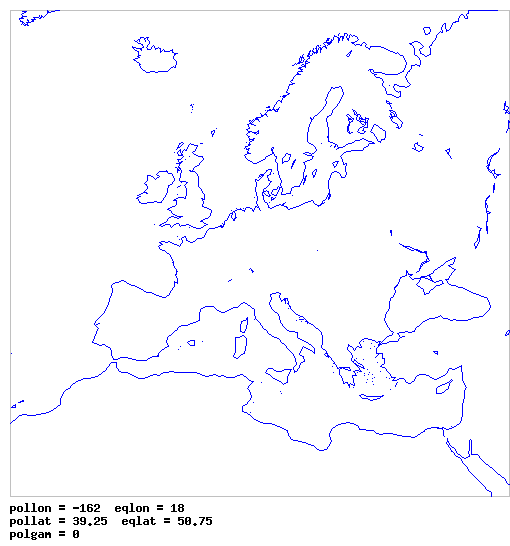 The operational weather forecast model COSMO of the German Weather Service (DWD) was extended to treat reactive gases and aerosos including secondary aerosols, soot, mineral dust, sea salt and biological material as pollen as described in Vogel et al. (2009). Modules for the emissions of mineral dust, sea salt and pollen grains have been developed. Processes such as emissions, coagulation, condensation, dry deposition, wet removal, and sedimentation of aerosols are taken into account. The online coupling enables the calculation of the interactions of gases and aerosols with the state of the atmosphere. COSMO-ART covers the continental to the regional scale. External parameters were generated using the WEB_PEP tool available on the COSMO-CLM Community webpage. For external parameters one grid cell extra is needed on all sides. External parameters were therefore retrieved for a domain starting at -29.53 lon, -24.97 lat, and with ie = 224, je = 218. Meteorological fields are taken from operational ECMWF analyses at 3 hr temporal resolution (analyses + short forecasts) and 0.25 deg x 0.25 deg horizontal resolution for domain 19N - 75N and 50W - 70E and 91 vertical levels. The grid size is thus 485x225x91. Chemical IC/BC data are taken from IFS-MOZART output. Sea salt is ignored as recommended. The three mineral dust size bins of IFS-MOZART are assigned directly to the three bins of COSMO-ART even if the size ranges are different. This creates the desired shift to larger sizes. The preprocessing of IFS-MOZART output is done in two steps. A first script (transform_AQMEII.ncl) converts the netCDF output of IFS-MOZART to a netCDF format compatible with NCAR MOZART-4 output used normally. 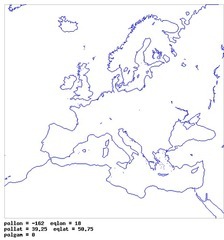 In addition, aerosol number densities are computed from the aerosol masses using Eq.3 and Eq.4 of Riemer et al. (2003). The second script (mozartNcep2int2lm_aqmeii.bash) prepares the output for the COSMO-ART pre-processor int2lm. OC -> VORG1Jm (accumulation mode internally mixed aerosol ORG1). ORG1 corresponds in the VBS scheme to a saturation concentration at 298 K of 1 ug/m3, which corresponds to an aged aerosol. Number densities for dust and accumulation mixed mode computed in transform_AQMEII.ncl: VSOILA0, VSOILB0, VSOILC0, VAC0m directly..
Athanasopoulou, E., Vogel, H., Vogel, B., Tsimpidi, A. P., Pandis, S. N., Knote, C., and Fountoukis, C.: Modeling the meteorological and chemical effects of secondary organic aerosols during an EUCAARI campaign, Atmos. Chem. Phys., 13, 625-645, doi:10.5194/acp-13-625-2013, 2013. Knote, C. and Brunner, D.: An advanced scheme for wet scavenging and liquid-phase chemistry in a regional online-coupled chemistry transport model, Atmos. Chem. Phys., 13, 1177-1192, doi:10.5194/acp-13-1177-2013, 2013. Knote, C., D. Brunner, H. Vogel, J. Allan, A. Asmi, M. Äijälä, S. Carbone, H. D. van der Gon, J. L. Jimenez, A. Kiendler-Scharr, C. Mohr, L. Poulain, A. S. H. Prévôt, E. Swietlicki, and B. Vogel: Towards an online-coupled chemistry-climate model: evaluation of COSMO-ART, Geosci. Model Dev., 4, 1077-1102, doi:10.5194/gmd-4-1077-2011, 2011. Riemer, N., H. Vogel, B. Vogel, and F. Fiedler, Modeling aerosols on the mesoscale-g: Treatment of soot aerosol and its radiative effects, J. Geophys. Res., 108(D19), 4601, doi:10.1029/2003JD003448, 2003. Vogel, B., Vogel, H., Bäumer, D., Bangert, M., Lundgren, K., Rinke, R., and Stanelle, T.: The comprehensive model system COSMO-ART – Radiative impact of aerosol on the state of the atmosphere on the regional scale, Atmos. Chem. Phys., 9, 8661-8680, doi:10.5194/acp-9-8661-2009, 2009.